Last year Ralph Ellis proposed a ‘dust theory of ice ages’ which we featured at the Talkshop. This research looks interesting in that context, and in its own right too. Every year, trade winds over the Sahara Desert sweep up huge plumes of mineral dust, transporting hundreds of teragrams—enough to fill 10 million dump trucks—across North Africa and over the Atlantic Ocean. This dust can be blown for thousands of kilometers and settle in places as far away as Florida and the Bahamas. The Sahara is the largest source of windblown dust to the Earth’s atmosphere. But researchers from MIT, Yale University, and elsewhere now report that the African plume was far less dusty between 5,000 and 11,000 years ago, containing only half the amount of dust that is transported today. In a paper published today in Science Advances, the researchers have reconstructed the African dust plume over the last 23,000 years and observed a dramatic reduction in dust beginning around 11,000 years ago. They say this weakened plume may have allowed more sunlight to reach the ocean, increasing its temperature by 0.15 degrees Celsius—a small but significant spike that likely helped whip up monsoons over North Africa, where climate at the time was far more temperate and hospitable than it is today. McGee and his colleagues obtained sediment core samples from the Bahamas that were collected in the 1980s by scientists from the Woods Hole Oceanographic Institution. They brought the samples back to the lab and analyzed their chemical composition, including isotopes of thorium—an element that exists in windblown dust worldwide, at known concentrations. So the dust blowing off North Africa has no effect on the formation of hurricanes in the Atlantic basin ? 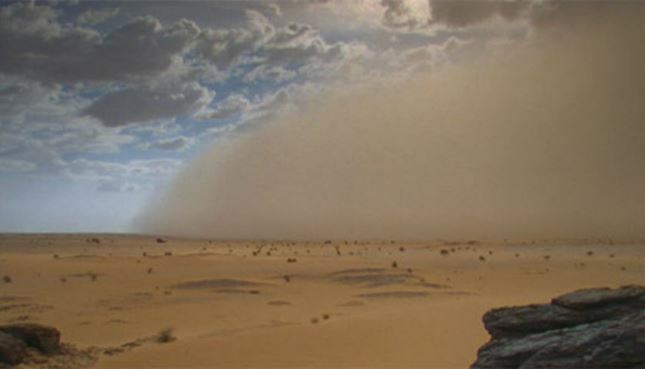 US researchers have discovered a link between Atlantic hurricane activity and thick clouds of dust that periodically rise up from the Sahara Desert. At times of intense hurricane activity, dust clouds were scarce, but in years with stronger dust storms, fewer hurricanes swept across the Atlantic. From satellite data they pieced together a dust record for the tropical North Atlantic beginning in 1980. A decline in dustiness means more sunshine can reach the surface and heat things up. They calculated that the decline in dustiness from 1980 to 2006 could have warmed the underlying sea surface temperature by 3ºC – an amount that is five times the observed increase during that period. 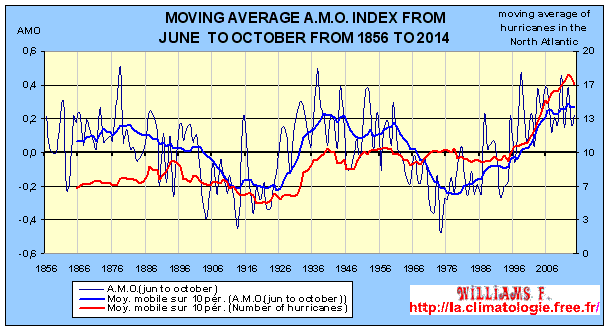 The AMO (the Atlantic Multidecadal Oscillation) is a cyclic variation of the Oceanic and atmospheric current in large time scale in the North Atlantic Ocean, that combines to alternately increase and drop the temperature of the sea surface Atlantic (SST)…The causes of the AMO are currently not well known because this oscillation is long. As for that AMO/Hurricane frequency chart posted by oldbrew, not sure I’d take the hurricane count before the 1950’s as ‘gospel’. Storms back there were ‘counted’ if a ship happened to come across them. If no ship reported a storm, it was presumed that no hurricane/tropical cyclone existed. Since the era of geostationary wx satellite, *every* tropical cyclone is accounted for. Those earlier numbers are most likely too low…just my opinion of course. On this matter the researchers are only confirming something that is already well known. But here dust is not a primary agent but rather an after-effect of something else, perhaps even twice removed. The dates are very important. 10,000 is about the end of the YD. 5000 – or some centuries before- is the time when the Earth went through a drastic change. The main question ought to be what caused the changes in Sahara climate and dust cloud formation at those two dates. Precession describes the rotational motion of the Earth’s axial orientation. Axial precession has a roughly 25.7 kyr cycle, and it was known to the ancient Egyptians, Greeks and Chinese as the Great Year (Yoke, 1985 and Campion and Dally, 1997). And its comparison to an annual year is quite valid, because the Celestial Great Year combines with orbital eccentricity to produce warm and cool seasons in each hemisphere. However, apsidal precession reduces the approximate 25.7 kyr Celestial Great Year down to an approximate 23 kyr cycle, which will be called herein the ‘Seasonal Great Year’ (SGY). So each Great Season of this Seasonal Great Year is approximately 5700 years long, and this is a significant periodicity because most of the interglacial warming events last about 5000 years. These are average figures as the SGY has ranged from 15 kyr to 27 kyr over the last 400 kyr (Laskar et al., 2004), a variable cycle that is likely to generate confusion if specific numbers or averaged lengths of precessional cycles are assumed to be controlling the interglacial cycle. oldbrew – the findings in the above subject appear to be contrary to the main thrust of the paper. The video on the Sahara tells from ocean deposits that the Sahara was already a desert well over a million years ago. Whereas last glacial termination occurred 12-14k yrs ago. Then 5000 years ago the dust levels increased – at a point when we are talking of major loss of remaining polar ice, not a start of de-glaciation (and equatorial ice too for that matter). I think that the model in the Ellis departs substantially from observed. Also one has to bear in mind that the changes, as evident in the sediments -video at 15:10 and at 32.30–, were very abrupt. the last at ~5500yrs ago (one my ask: why evidence keeps pointing to Dodwell?). I wonder where all that sand and dust came from. Is sand from sandstone (maybe the other way about) if so where was all this sandstone originally? large fleets of tiny drones sparking widespread northern hemisphere forest fires.—–Perhaps we’ll live to see some of your theories tested—“. 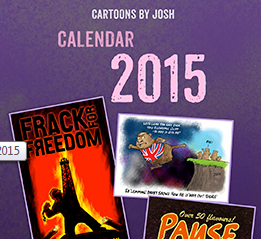 Recent news on tv came to mind; of burning oil-fields and blackened children. Would that black soot reach the poles and test the theory? Ocean salinity rather than SST seems an interesting method for predicting extreme rainfall events! Are moisture absorbing, hydrophilic/ hygroscopic, salt aerosols the link to heavier rainfall event? They seem likely to be the catalyst to increasing soil moisture, reducing dust amounts and allowing moist conversation to get established.